I remember watching the movie “Goldfinger” in 1965 and being fascinated by the gadgets James Bond had at his disposal. One such gadget was the tracking device in James Bond’s Aston Martin DB5. It was a green radar screen in the console of the car, tracking the bad guy’s homing device, showing as a dot on the screen with a map overlay. I knew it was fake but thought that someday that navigation technology would be in cars. GPS is an acronym for Global Positioning System (GPS) and is the name of a satellite navigation system, owned by the United States and operated by the US Air Force. 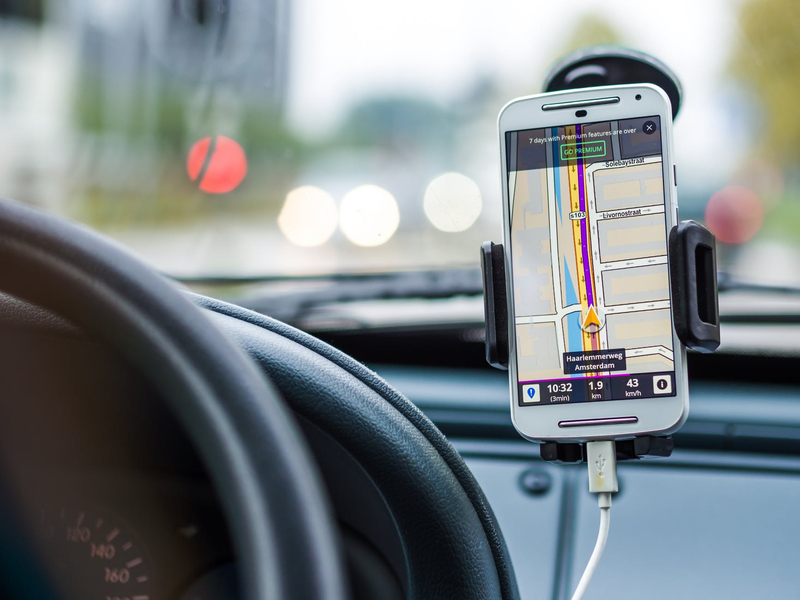 Satellite navigation “satnav” means using a portable radio receiver to pick up speed-of-light signals from orbiting satellites, so you can figure out your position, speed, and local time. Because it’s a broadcast system based on radio signals that reach all parts of our planet, any number of people can use it at once, anywhere they happen to be. To achieve global coverage for GPS, 24 satellites are required. The first of the 24 was launched in 1989 and the 24th was launched in 1994. GPS satellites only last about 10 years, and often need servicing during their lifetime, which is why there are currently 32 GPS satellites in orbit. The extra satellites fill in the gaps when the core 24 satellites need to be serviced or decommissioned so that coverage is maintained. Using a constellation of 24 GPS satellites ensures that at least 4 satellites are within line-of-sight of any location on Earth at all times. With satellite navigation, your navigational “landmarks” are space satellites whizzing through the sky above your head. Because they’re about 20,000km (12,600 miles) away, well beyond Earth’s atmosphere, and because they’re constantly moving (not stationary, like Earthbound landmarks), finding your position from them is a bit more tricky. If you pick up a signal from one satellite and you know it’s 20,000km away, you must be somewhere on a sphere (not a circle) with a radius 20,000km, centered on that satellite. With two signals, from two different satellites, you must be somewhere where two spheres meet (somewhere in a circle of overlap). Three signals put you at one of two points on that circle—and that’s usually enough to figure out where you are because one of the points might be up in the air or in the middle of the ocean. But with four signals, you know your position precisely, including altitude. Finding your location this way is called Trilateration. Suppose you’re carrying a GPS-enabled cell phone or satnav in your car. How does it know the exact distance to the three or four satellites it uses to compute your position? Every satellite constantly beams out signals that are, in effect, time-stamped records of its position at that time. Since they’re carried by radio waves, the signals must be traveling at the speed of light (300,000km or 186,000 miles per second). Theoretically, then, if a receiver picks up the signals sometime later, and has a clock of its own, it knows how long the signals have taken to get from the satellite, and how far they’ve traveled (because distance = speed × time). That sounds like a nice, simple solution but it introduces two further problems. First, how long does the signal take to travel? Haven’t we just swapped one problem for another (time for distance)? The solution to this involves a hi-tech version of “synchronizing watches”: each satellite carries four extremely precise atomic clocks, typically accurate to one second in 100,000 years), while the receivers (which have less accurate clocks of their own) receive their signals and compensate for the time it takes for them to travel down from space. That means each receiver can figure out how long each signal has taken to reach it and therefore how far it has traveled. What was once science fiction is now science fact. We can find our location anywhere in the world. We can lay out a route for a trip and know the distance, where we are en route, how fast we are traveling and when we will get there.